You or someone you know has probably made an electrochemical cell. It can happen in your mouth if two different kinds of metal touch. Step one: get braces or metal fillings. Step two: accidentally get a bit of aluminum foil in your mouth. When the two kinds of metal touch, current flows, and oooh! It’s hard not to notice it. 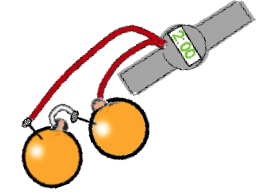 Two pennies, two oranges, and some galvanized nails can create enough power to run a digital watch. Each different kind of metal has a different “grip” on its electrons. When metal dissolves in water, atoms that leave the metal may pull extra electrons with them or leave electrons behind. This creates an imbalance of charge causing electricity to flow from one metal to the other. A battery is made from several electrochemical cells. The “Holy Grail” in electric vehicle design is to develop the lightest and most efficient batteries. 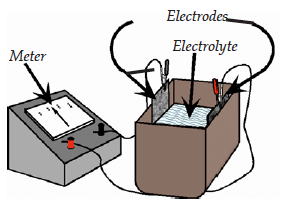 You can make a simple electrochemical cell using a small container, two dissimilar metals (called electrodes), and a liquid (called the electrolyte). Use a meter to measure the electrical output. Your challenge is to find out how to make the most effective cell. What are some of the variables you could test in experiments? Write a laboratory report to summarize your findings. << Back to Energy Use Chapter 9 - "Energy for Transportation"